“The Critical Relationship: Our Relationship with God behind Closed Doors”: a rejuvenating call for genuine spiritual intimacy. “The Critical Relationship” is the creation of published author Tim Lozier, a graduate of Appalachian Bible College with double degrees in the Bible and youth and family ministries; he is from New York and actively participates in several church ministries. Published by Christian Faith Publishing, Tim Lozier’s new book is a straight-talking practical guide for putting God first and center, where he belongs. Lozier invites the reader to shun the pretenses and view the Christian religion honestly and the critical relationship inherent in it. View a synopsis of “The Critical Relationship: Our Relationship with God behind Closed Doors” on YouTube. Consumers can purchase “The Critical Relationship: Our Relationship with God behind Closed Doors” at traditional brick & mortar bookstores, or online at Amazon.com, Apple iTunes store, or Barnes and Noble. 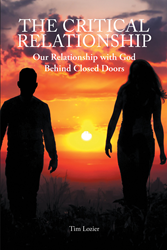 For additional information or inquiries about “The Critical Relationship: Our Relationship with God behind Closed Doors”, contact the Christian Faith Publishing media department at 866-554-0919.